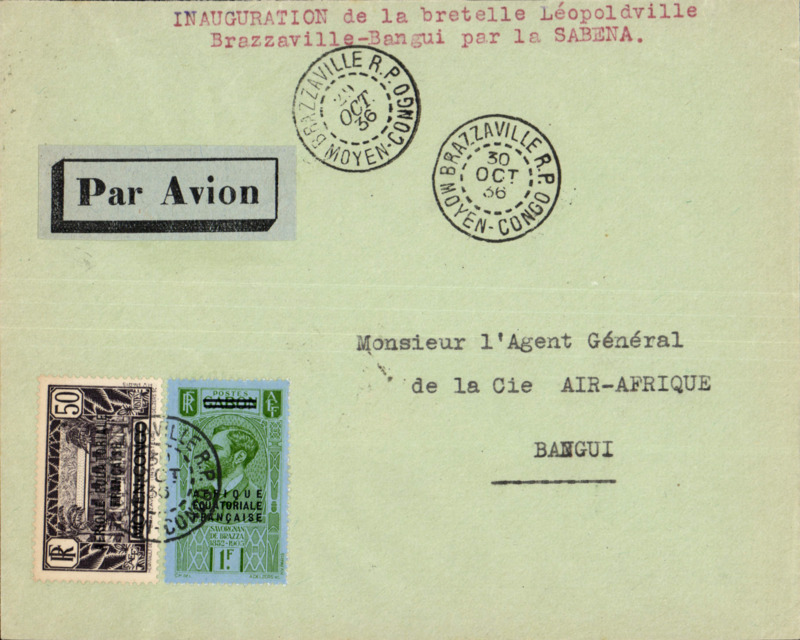 Cie Generale Aeropostale, early airmail, Brazzaville to Colombes, France, bs 25/11, registered (label) cover correctly franked 50c postage, 1F registration and 3F Air surcharge, surface to Boma, by sea to Dakar, and CGA to Toulouse and on to Paris. Regie Air Afrique, return of the 8th experimental flight between Brazzaville and Algiers carrying mail and BCG (anti-tuberculosis vaccine, piloted by Capt. 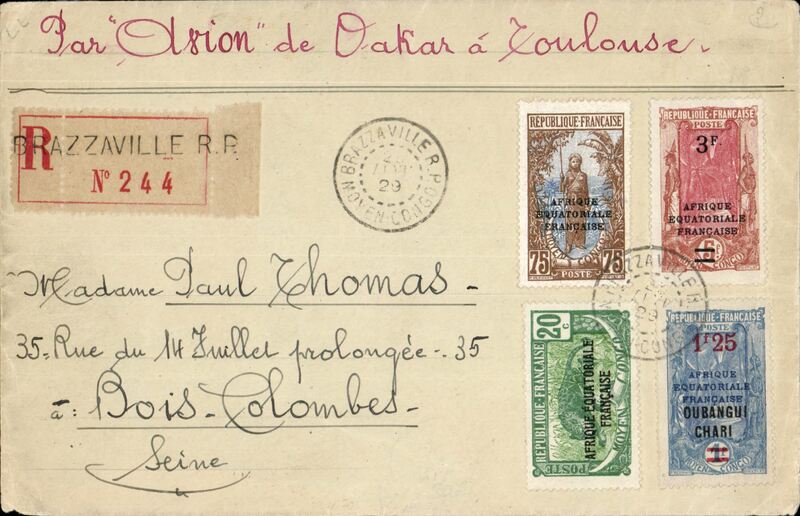 Jean Dagnaux, airmail etiquette cover correctly franked 50c postage only, NO airmail surcharge, canc Brazzaville cds, ms 'Par Avion/Alger-Congo'. 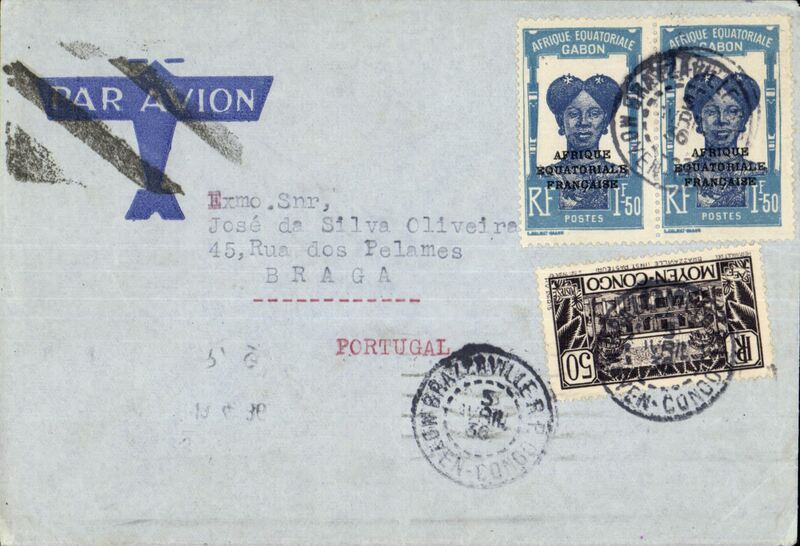 French Congo to Portugal, Brazzaville to Braga, bs 13/4 via Marseille Gare Avion 10/4, imprint etiquette cover correctly franked 1F50 overseas postage and 2F airmail surcharge to Marseille, etiquette cancelled in Marseilles by framed black diagonal Jusqu'a. Carried by Air Afrique to Algiers, then Air France to Marseille, then by rail to Portugal. 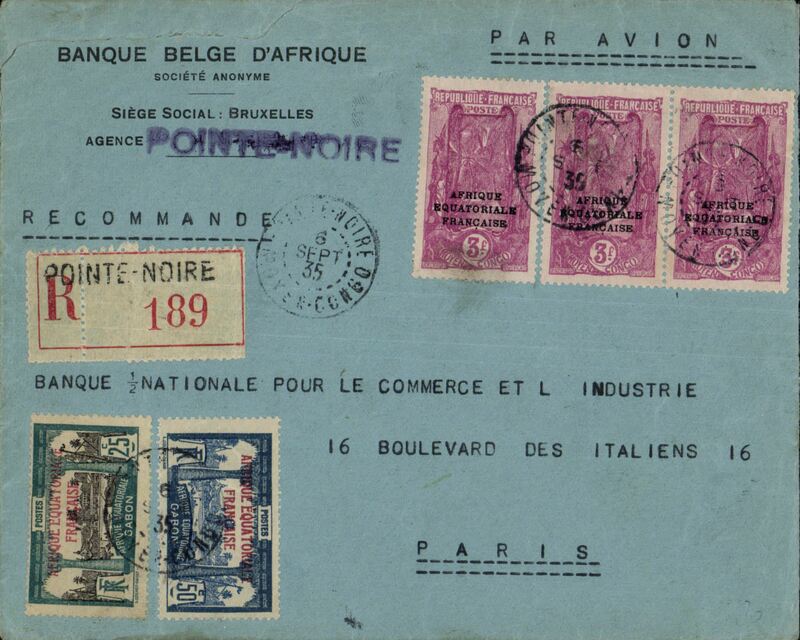 Nice item, good routing..
Air Afrique/Air France, Pointe Noire to Paris, Le Bourget-Port Aerien 13/9, registered Banque Belge D'Afrique corner cover correctly franked 50c postage, 8F airmail (4X2f per 5gms and 1F25 registration, canc Pointe Noire cds, typed 'Par Avion'. Flown Air Afrique to Algiers via Bangui, Fort Lamy and Zinder, then by Air France to Marseille and Paris. Nice item. Regie Air Afrique, Brazzaville-Tamatave, Madagascar , bs 18/11, carried on F/F Algiers-Madagascar extension from Elisabethville to Tananarive, plain cover franked 50c postage (no air surcharge). 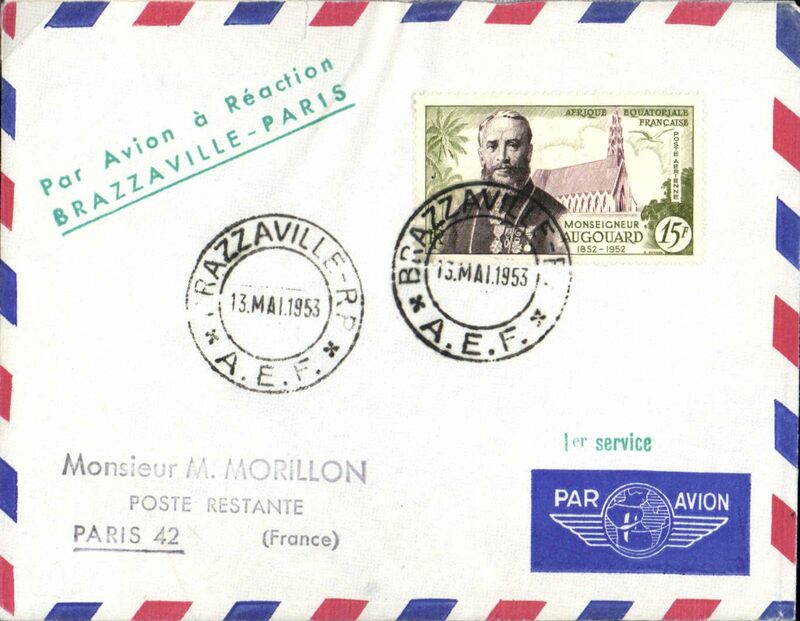 Pointe Noire to Paris, bs Paris Avion 25/6, carried by rail to Brazzaville to connect with the Air Afrique flight departing 20/6, plain cover franked 50c postage + 2F air surcharge, black two line "Par Avion/Brazzaville-Niger" cachet. 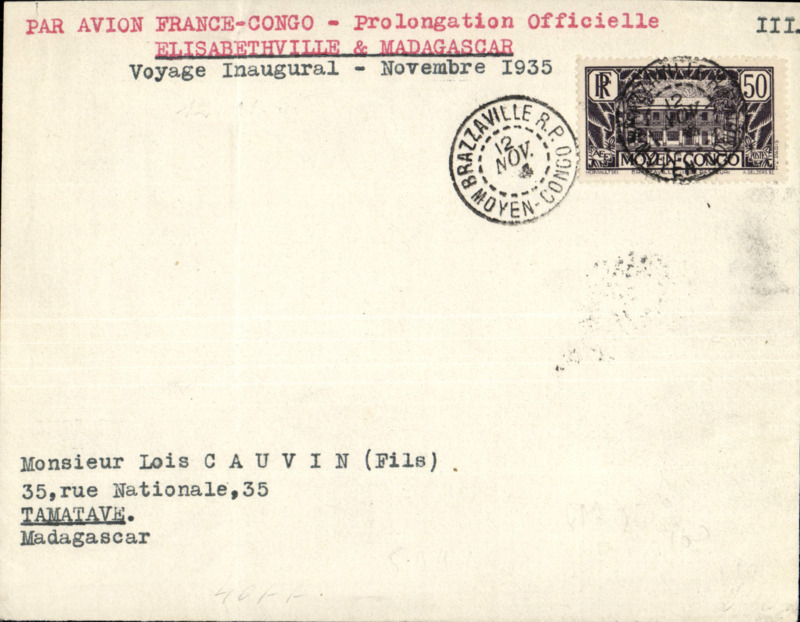 F/F French Congo to Oubangi-Chari, bs 30/10, airmail etiquette cover correctly franked 50c postage and 1F airmail surcharge. Inauguaration of Brazzaville-Bangui branch line following the by-pass of Brazzaville by new Sabena and Air Afrique services to Elisabetthville and Madagascar. 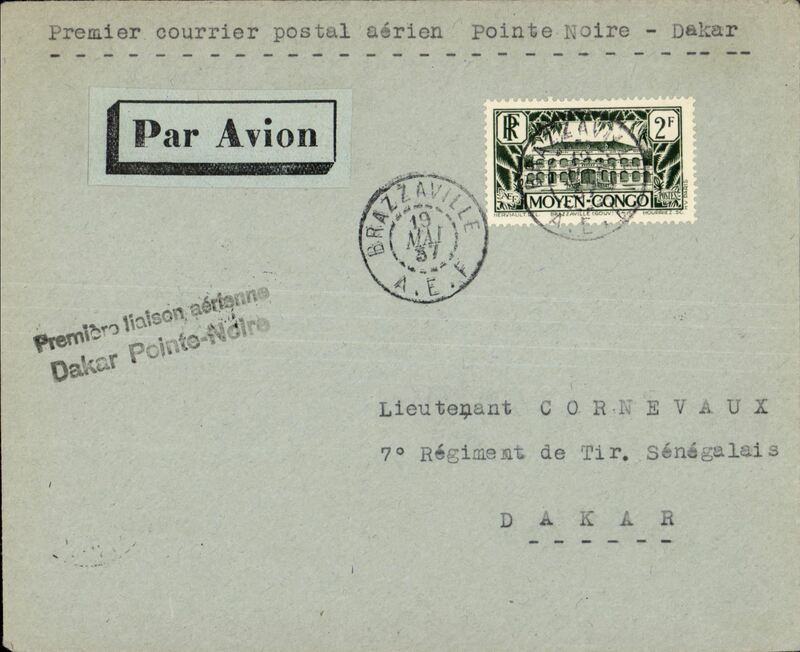 An uncommon item, and one for the exhibit..
Aeromaritime F/F Pointe Noire to Dakar 23/5, airmail imprint etiquette coverer correctly franked 50c postage and 1F50 air surcharge, canc Brazzaville 19/5, black two line flight cachet. Rail from Brazzaville to Pointe Noire, then OAT to Dakar. 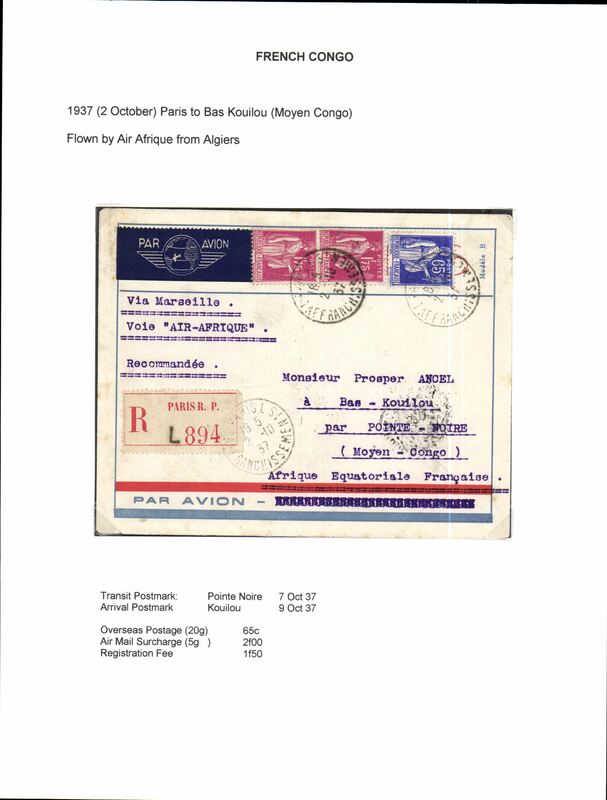 Air France/Air Afrique, into Bas Kouilou, Middle Congo, 9/10 arrival cds, via Pointe Noire 7/10, registered (label) airmail etiquette cover correctly rated 65c overseas postage, 2F airmail surcharge (5g), and 1F50 registration fee. 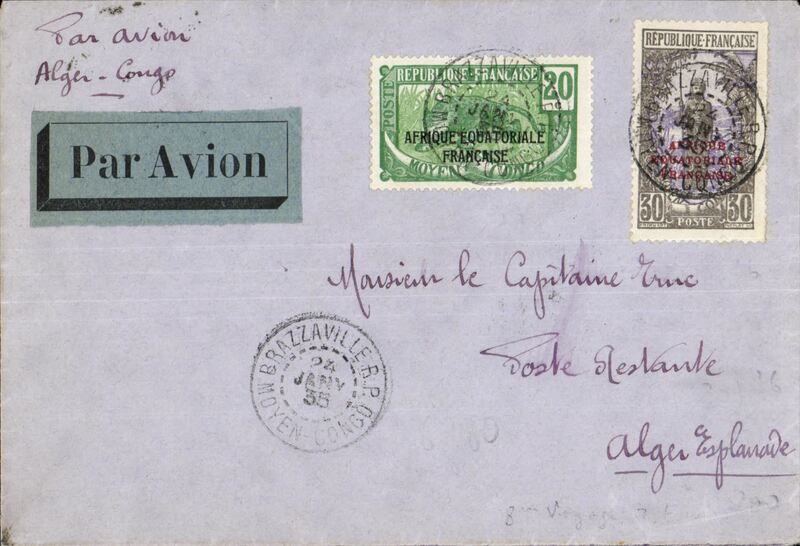 Flown by Air France to Algiers and OAT by Air Afrique. Written up on exhibition page with nice route, airline carrier and postage rate documentation. 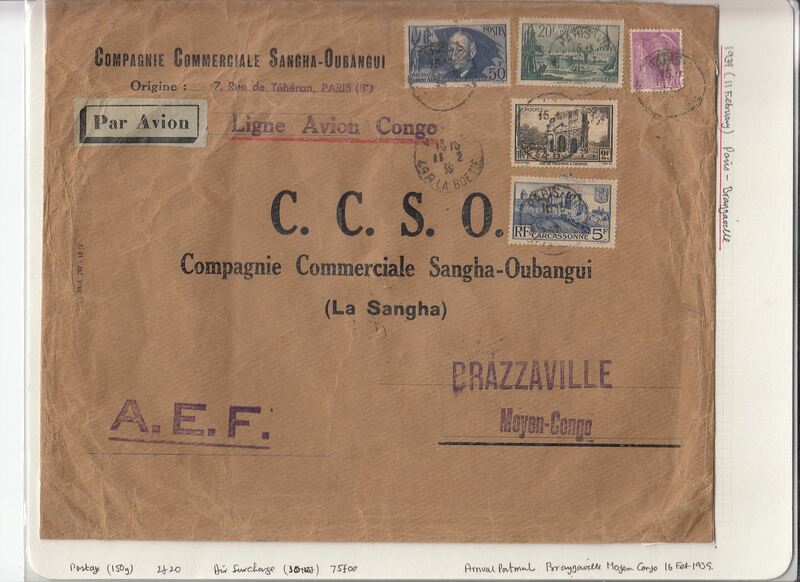 Air France/Air Afrique, highly franked 30x rated CCSO commercial corner cover flown into Brazzaville, Middle Congo. 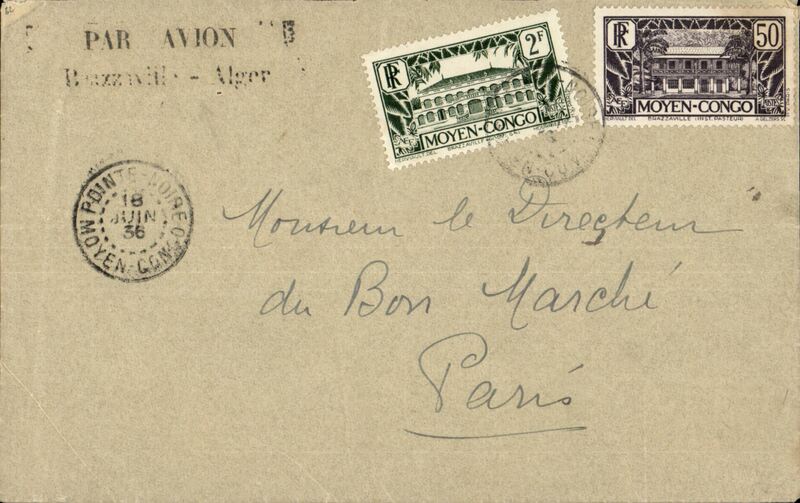 16/2 arrival cds, from Paris, correctly rated 2F20 ordinary (French Colony therefore internal rate) and 75F (SG 596, 599, 601, 612a, cat SG £80+ used) airmail surcharge (30 x 2F50 per 5g), uncommon violet straight line "Ligne Avion Congo" hs, violet 'A.E.F.' hs, pale grey/black airmail etiquette, intact original CCSO wax seal verso. 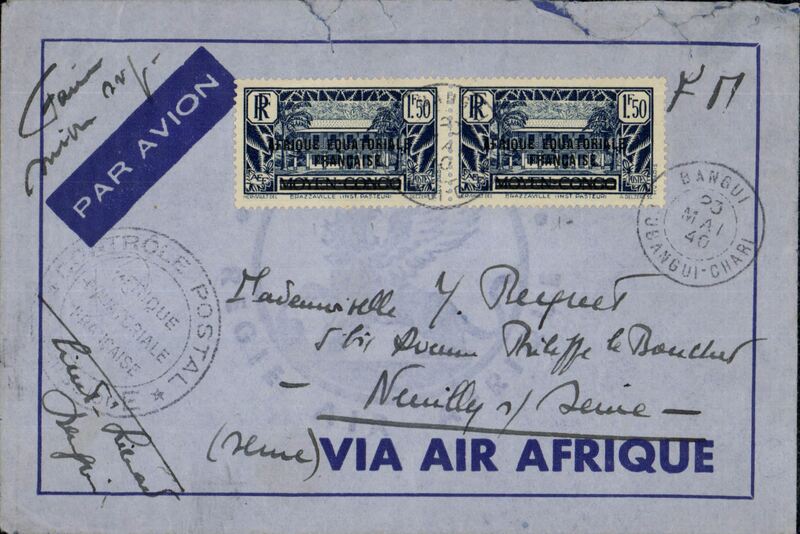 Air Afrique, WWII censored cover, Bangui to Neuilly sur Sein, blue/dark blue Air Afrique imprint etiquette cover free franked Franchise Militaire + 3F airmail surcharge (overfranked 50c), black double ring 'Afrique Equatoriale Francaise, code E (Ubangi-Chari) censor mark. WWII censored covers are uncommon. Free French WWII dual censored cover from Port Sibut, French Congo to Ohio, USA, via Bangui 9/9 and Brazzaville 23/9, imprint etiquette air cover correctly franked 2F50 postage an 15f airmaill Free French stamps, canc Port Sibut,typed 'Par Avion',black double ring 'Afrique Equatoriale Francaise, code A (Middle Congo) censor mark, sealed black/white "Afrique Francaise Libre/Controle Postal" censor tape tied by "Ouvert lPar L'autoritי Militaire" censor mark, also Miami EB censor tape. Flown to West Coast by Lignes Aerienne Militaire (a military airline flying under the flag of the Free French Army and was joined by Cameroon and French Equatorial Africa after the fall of France in 1940); or by the Sabena/BOAC Khartoum-Bangui-Takoradi service. Then OAT to Miami by FAM 18. 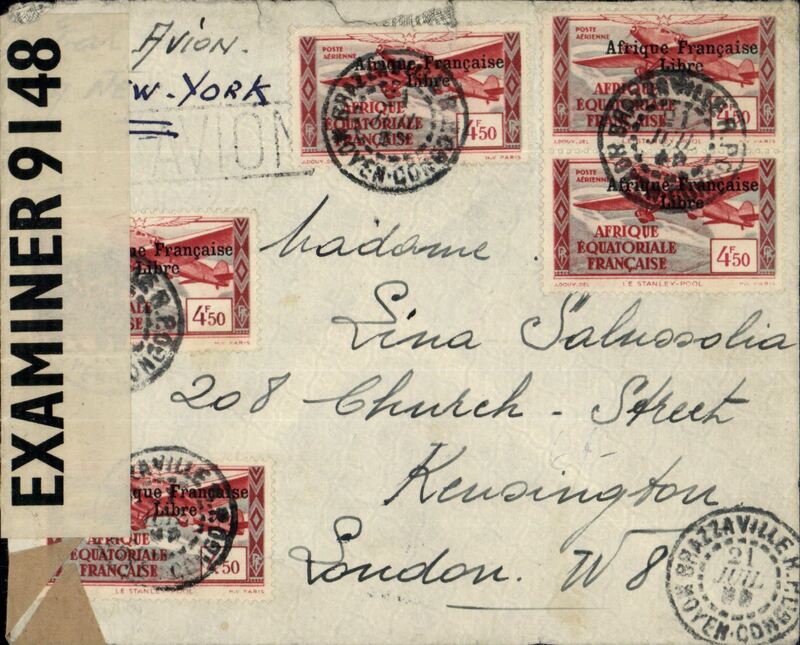 Brazzaville to London via New York, WWII dual censored cover, correctly rated 2F25 postage to Europe + 22F (1F75 verso) to Europe via New York, canc Brazzaville 21 Jul 4? (actual year illegible), ms "Par Avion/via New York", black framed 'Avion' hs, sealed GB PC90 OBE censor tape, black double ring 'Afrique Equatoriale Francaise, code A (Middle Congo) censor mark. Likely Free French Military Airline orLignes Aerienne Militaire to West Coast, the Pan Am FAM 18 to New York before OAT to Great Britain. 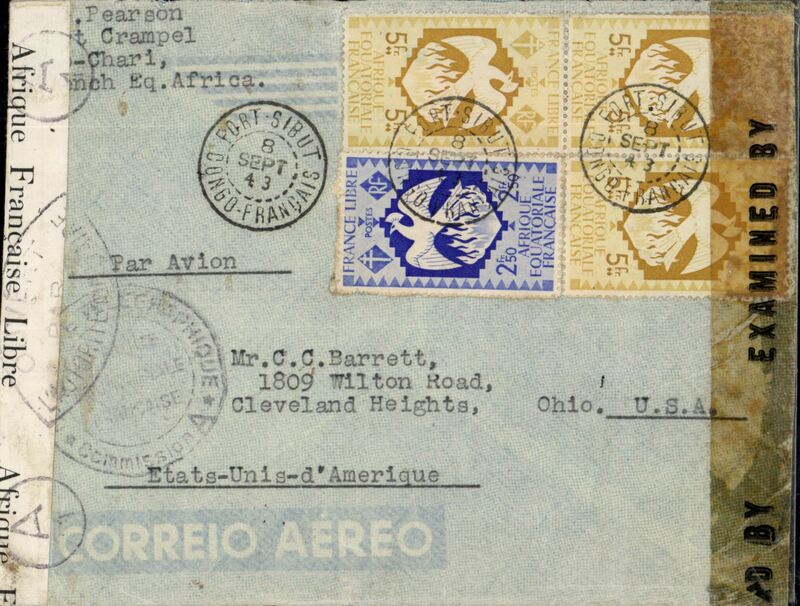 Scarce item..
Union Aeromaritime de Transport (UAT) Comet 1 Trial flight, Brazzaville to Paris, bs 14/5, airmail cover franked 15F Afrique Equatorial Francais stamp canc Brazzaville/AEF/13 Mai 1953 cds, green two line flight cachet "Par Avion a Reaction/Brazzaville-Paris". Scarce item in pristine condition.